Money is tight, and Naima wants to do something to help her family. If only she were a boy like her friend Saleem, she'd be able to drive her father's rickshaw and add to the family's income. Naima does have a special talent; she can paint beautiful alpanas -- traditional patterns used by women to decorate Bangladeshi homes during special occasions -- but how can this help her make money? When Naima decides to disguise herself as a boy and drive the rickshaw, she accidentally crashes it, and the family's debt soars even higher. Now Naima is more determined then ever to help her family -- and prove that being a girl can be a good thing. 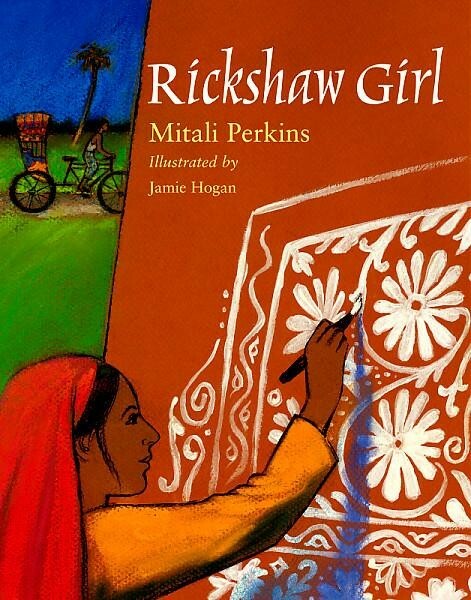 Mitali Perkins was born in Kolkata, India and immigrated at age seven to the States with her family. Her other award-winning books for young readers include Bamboo People,Rickshaw Girl, Secret Keeper, and the First Daughter books. Mitali speaks frequently about the transforming power of stories as well as growing up between cultures.